Before I start, this place is not to be mistaken for the restaurant up the road. This was the pub and I dont really want to paint the two with the same brush. Onwards. I'm sure many of you have been in the same situation. You're out at the pub and you are desperately hungry, spurred on by the beer munchies. I was meeting up with some of my old uni friends in a pub near London Bridge and discovered that the pub we were in served "Thai" food. As you can see, what I got was a nightmare from Iceland. 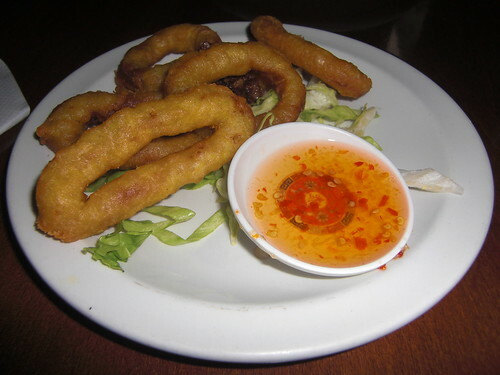 Battered calimari rings with bottled sweet chilli sauce. Damage to me, £4.50, damage to them, I would be surprised if it cost them more than 20p to put this "dish" together. Now, I ordered some noodles advertised with holy basil, chicken and chilli amongst other things. I was so underwhelmed by this food, I didnt even bother taking down what it was meant to be. If I was being nice, I would say that the noodles had a nice texture. If I was being honest, I would say that it felt like a bunch of leftovers thrown together with far too much chilli and a cloying amount of holy basil withough any evidence of holy basil actually being in the dish. Adding insult to injury, I paid £7.50 for this. Really poor. Totally disappointed with this place. 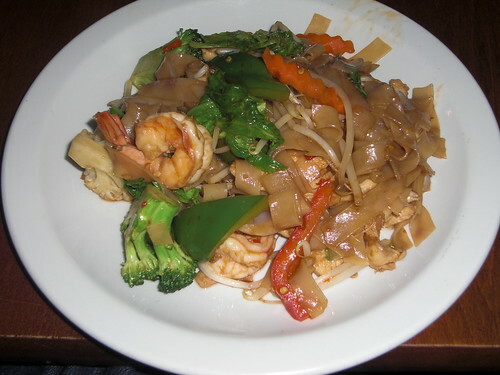 A very poor Thai restaurant and even the pub part was disappointing. The beer was off and so was I, never to return again. Bum! :( the thing is there is so much decent thai around, it really can't be that hard to make right?? Poor you, don't EVER go back! I've found the food at Suchard's pub quite disappointing too. The restaurant is better!